Sometime last year I thought that it would be nice to crochet Miss E a little cardigan for the winter. I was near a shop that I knew sold yarn and patterns so chose a simple pattern from Hayfield (pattern 4410) for a crochet cardigan. Miss E’s favourite colour is yellow so I found some gorgeous Rico Baby So Soft in a light yellow colour. Originally I had decided to make the round neck cardigan however halfway through the pattern Hayfield got a bit lazy and kept saying to refer back and forth to * and **. Quite frankly I was confused by all the hopping backwards and forwards. 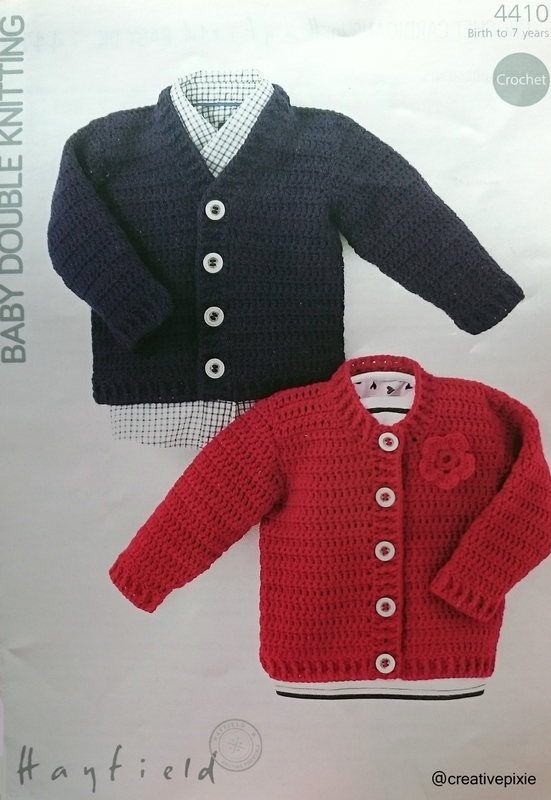 (Note to crochet/knitting pattern companies – please print the whole pattern as it is to be completed from start to finish.) I had gone wrong somewhere and so I made the difficult decision to frog what I had crocheted back to a salvageable point. This prompted me to change plans and crochet the v-necked cardigan. 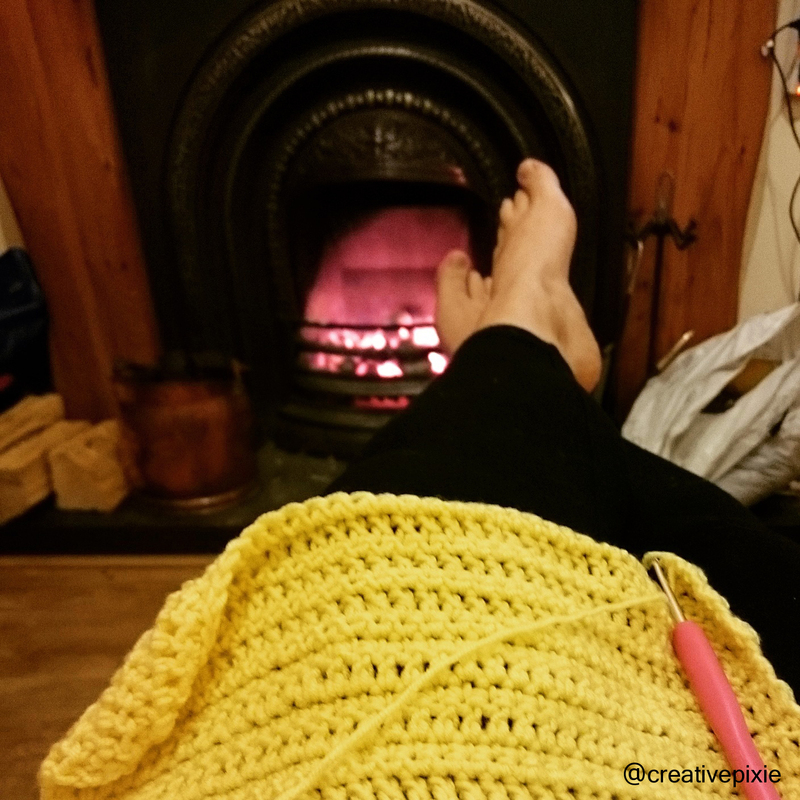 I found it enjoyable crocheting the cardigan in front of the fire, especially on these cold winter evenings. I finally finished the cardigan last night – helped by my girls being entertained by a DVD of Tinkerbelle and the Pirate Fairy. Miss E chose some medium sized wooden buttons with a green starburst design painted on them. I am really pleased with how the v-neck turned out. Miss E was really happy with the cardigan though I admit it’s a bit big on her (it’s size 4-5) but at least she’ll get her wear out of it. I found the pattern a bit difficult to follow at times, though as I said earlier I think this is down to how the pattern was printed up rather than the design. It used simple enough stitches but lots of counting a certain stages. I give this pattern a 4/5. 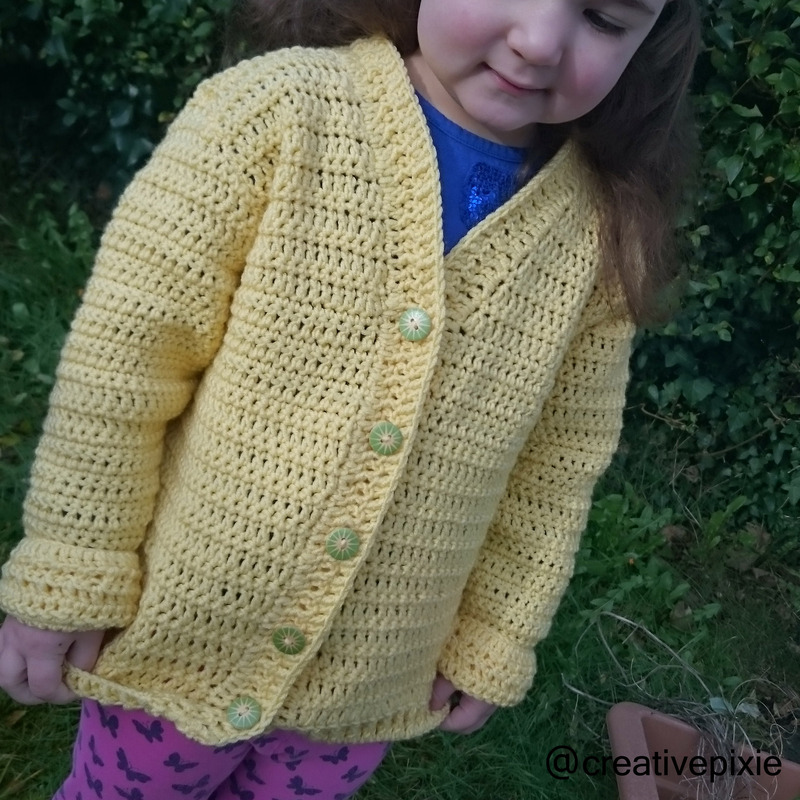 I ‘d love to crochet another cardigan, any suggestions of patterns to look out for? I’ve already had a request from Miss P to crochet her a dog from a pattern book, Super Cute: 25 amigurumi animals to make, I received for Christmas. I also have an exciting crochet project to be completed for March but I’ll share that with you nearer the time. Jean, what a delightful cardigan! Love the color and the buttons with their sunburst design, they go perfectly with the sweater. Thanks Marianne. I’ve had the buttons for years so I’m glad I found a use for them. 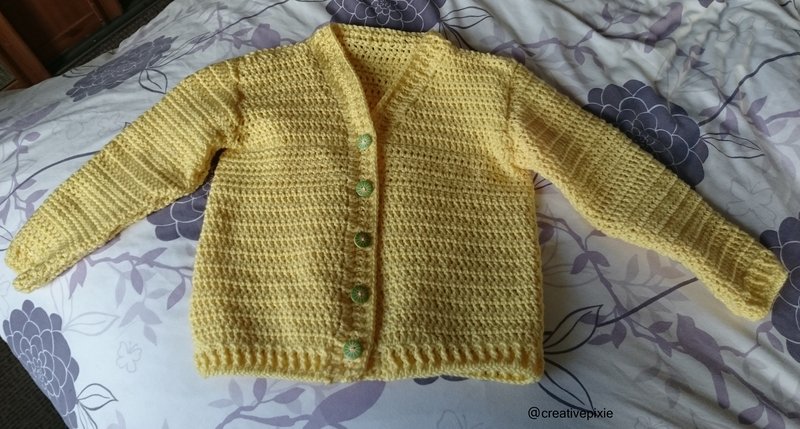 I love that yellow and the buttons! It looks great. You’re giving me courage to crochet a garment for my five year old nephew. The whole growing up fast thing makea me a little weary, but I think I’d keep the piece on the larger end likes yours. Crocheting clothes for children is definitely quicker 😉 Miss E is 3 so I measured her up and thought it’d be best making up the 4-5 size rather than the 2-3. I’ll check back to your blog to see how your garment progresses. Smart! That’s an age where they can start to wear clothes for a longer time, yeah? S.’s jacket is going simultaneously slow and fast. I’m using a 2.25 mm hook, which I don’t think I mentioned in my post and DK weight yarn. Next entry will be all about what I’m not liking so far in the project.